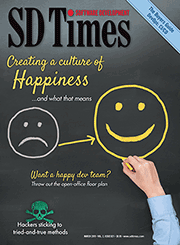 In this new category, the editors of SD Times recognize that the way development is done today has changed from how software was created only a decade ago. No longer do projects take 18 months, with features locked down a year before final delivery. Software today is built in rapid iterations, with continuous builds and integration into the product for multiple updates per year. Here, we recognize the companies and projects that make the tools that enable this to happen.